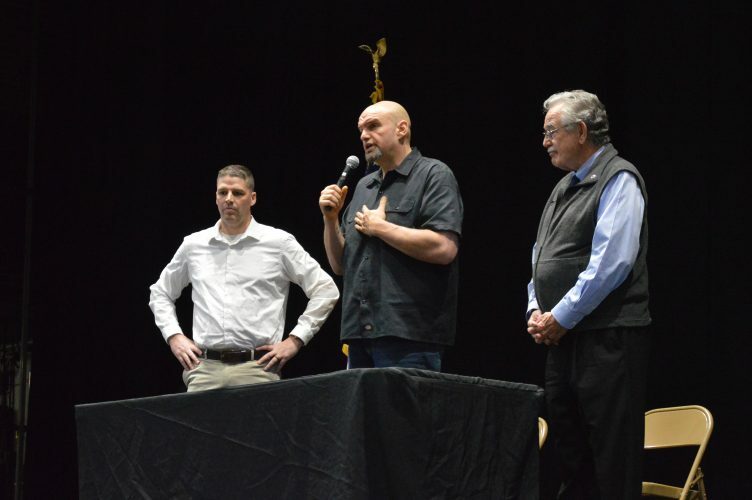 As the state prepares for Gov.-elect Tom Wolf to take office, leaders from the natural gas industry voiced their disapproval of a proposed 5-percent severance tax during a media call Tuesday afternoon. Jeff Sheridan, Wolf’s press secretary, said the reason for the severance tax is because Pennsylvania is the only gas-drilling state without the tax. “The natural gas industry is getting a free ride while schools are suffering,” Sheridan said. The 5-percent tax aligns Pennsylvania with other gas-producing states, such as West Virginia. It is less than the tax paid by Texas and Alaska, he said. The profitability for the gas industry already is suffering under the current tax structure, said Lou D’Amico, Pennsylvania Independent Oil and Gas Association president and executive director. The number of rigs has been cut almost in half from 2011 to 2013 and the number of wells dropped by 750 in the same time period, D’Amico said. Part of the reason for the reduction in the number of wells is because of the impact fee. Pricing also has affected that number, he said. That pipeline capacity is a critical part not only to the state, but also to the nation in terms of growing jobs and energy security, Wissman said. “Frankly, if we don’t get this opportunity right for Pennsylvania, we’ve learned that capital can flow like water either into a state or from a state,” Spigelmyer said. While the gas industry can move elsewhere to locations where operators can make more money, the small ancillary businesses cannot, he said. “They’re the groups and companies that lose deeply if we don’t get this occasion correct,” Spigelmyer said. Growing up in central Pennsylvania, he watched his entire high school class move away from the area to find jobs, but now people have opportunities to find jobs locally, he said. “The shale industry has put people to work,” Spigelmyer said. A severance tax will not fix the fiscal problem. What will is directly dealing with issues like pension reform, he said. He referenced the Pennsylvania Budget and Policy Center (PBPC)’s findings in June about corporate net income tax payments made by drilling companies falling as gas production boomed, according to the Department of Revenue. “In 2013, oil and gas producers paid just 9 percent of corporate income taxes collected from the industry while drilling support companies, pipeline, distribution and other related companies paid the other 91 percent,” according to the PBPC. Spigelmyer said he met with Wolf in August to discuss the issues of natural gas pricing and commodity pricing in the state. “One message was made very clear in the common role of business: if you’re going to tax something, you’re going to do a lot less of it,” he said. If a significant tax is in place like the severance tax, there are going to be less economic opportunities as a result, he said. Wolf ran on the issue of a severance tax, Wissman said. The natural gas industry is the only one that has an impact fee in addition to all of the taxes it and other industries pay, which is not fair for the newly arriving industry that has created so many jobs, D’Amico said. All it results in is penalizing the industry by overtaxing it, he said. Still, with the possible additional tax, Spigelmyer does not believe the gas industry will completely leave the area. Fewer rigs and fewer jobs are possible by squandering the generational opportunity, he said. “You can damage this forever in the commonwealth,” Spigelmyer said. The operators are going to look to see if it is economically viable to extract out of the state or if they should look at other places, Wissman said. Already companies have begun selling properties in the state to move to other areas, D’Amico said. * In 2012, Pennsylvania enacted an “impact fee” on natural gas wells drilled into Pennsylvania’s Marcellus Shale that generates a relatively small amount of revenue from the expanding gas industry. PBPC estimates that, using a “moderate” production scenario, Pennsylvania’s impact fee will bring in less revenue than a severance tax comparable to that of Texas or West Virginia. As production increases over time, the gap grows larger between the revenue generated at the West Virginia or Texas tax rates and from Pennsylvania’s impact fee. * Pennsylvania would benefit from switching from its current impact fee to a severance tax. Depending on the estimate, the severance tax could raise two to four times as much revenue as we expect from the impact fee, with this difference growing over time. Whether the revenue gain from switching to a severance tax is $400 million, $600 million, or more, this is exactly the type of recurring revenue needed to help restore harmful cuts to our schools, help bridge an estimated $2 billion state budget gap in 2015-16, and help close the state’s ongoing structural deficit where revenues grow more slowly than spending. In a late-September story that appeared in the Philadelphia Inquirer, former Gov. Tom Ridge said he believes Pennsylvania will adopt a natural gas severance tax. “I think there will wind up being a severance tax in this state. Just my feeling,” Ridge said during a gas-industry conference Sept. 26 in Pittsburgh. According to the Inquirer, Ridge did not advocate a tax, but said political pressure to enact one would be undiminished as long as Pennsylvania remains the only major gas-producing state without one. “It’s always going to be out there, particularly because other states have it. Some of them are higher than others,” Ridge told the Inquirer. Ridge acknowledged the concerns of gas-industry promoters, who fear that a severance tax would make Pennsylvania’s marginal gas-producing areas uncompetitive, and that some oil and gas rigs would move to more profitable regions in other states. “The question becomes, they’d better be doggone careful that the burden imposed … doesn’t exceed the tax and regulatory burden you’ve got elsewhere, because you’ll just pick up the equipment and go elsewhere,” Ridge told the Inquirer.